PAY IT FORWARD – Anonymous and generous people, who presumably believe in my skills as a counsellor or therapist, have made donations that have allowed me to provide counselling or therapy on the pay-it-forward principle. This means that your session with me are free, they have been paid for by these generous people. I would encourage you to make further donations for future clients, so I can keep this service going. As a result of this situation I am frequently having to put people on a wait list, or turn them away. I prefer to see people who are medication free, as I have found that my effectiveness ratings tend to be poorer with people who begin therapy already on psychiatric medication. I am not against medication, but do believe that the “anaesthetists” should play a secondary role, and the “therapeutic surgeons” the primary role in the “theatre of the mind”. In other words, if we collaboratively decide that medication might help, then we will contact your doctor about prescribing these. I am strongly attracted to the idea that the pay-it-forward economic philosophy is one of the better antidotes to the neoliberal economic philosophy that pits us all in competition against each other and the environment. If the donations I receive outstrip my humble needs, I will forward excesses to eco-friendly causes I believe are enhancing our attunement with the world. 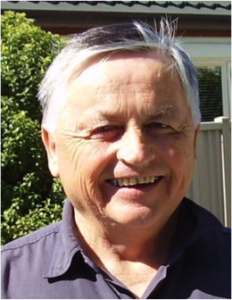 I am currently residing in Herne Bay Auckland, but plan to move to the Waikato later in the year. I currently supervise some practitioners by Skype; and see some clients in a venue suitable for them. SUPERVISION. I provide supervision to a wide range of counsellors, social workers, and psychologists; from student beginners to very experienced practitioners. In keeping with the pay-it-forward principle we can negotiate the costs of this; as in many cases an employer is meeting these costs. EFFECTIVENESS. I take great pride in monitoring my effectiveness as a therapist. I utilise Duncan & Miller PCOMS (Partners in Change Outcome Monitoring System) or FIT (Feedback Informed Treatment) system. This entails administering the Outcome Rating Scale at the commencement of each session, and the Session Rating Scale at the end of each session. This data is then fed into a computer programme called ASIST, which can analyse the effect size of any change, and compare these with a (US) normative sample. I believe, on the basis of my membership to a group of other NZ practitioners adopting this system in the early 2000s, that I may have been the first therapist in NZ to begin using this system. 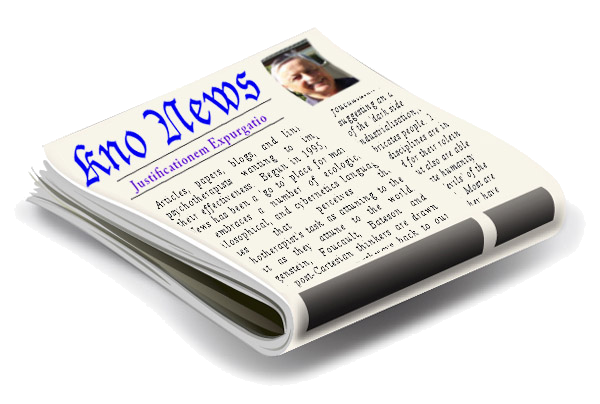 (I have also had the measures translated into Māori, and developed a separate Māori measure based on the Whare Tapa Wha [see my articles]). Effect size is a form of standardized change score. It is calculated by dividing the actual raw score by the standard deviation of the measure. This statistic permits comparison of results obtained by different measures and is commonly used in research reports of treatment outcomes. The change index is the client’s reported change adjusted for the severity of the distress upon intake. It is calculated by subtracting the actual change score from the expected change (baseline target score). Please note: The colour coding scheme compares the amount and pattern of change experienced by clients in your practice to the amount and pattern of change experienced by clients in a USA normative sample. Accordingly, as you enter cases ASIST will show you by color whether your effectiveness is Above Average, Average or Below Average. As can be seen I am consistently in the ‘Above Average’ range and seem to perform better in late winter than other times of the year. In 2011 I was working in a NZ agency with other mental health professionals (psychologists, psychiatrists, social workers, family therapists, occupational therapists, nurses, etc) . At that time this agency was monitoring their outcomes on the basis of closure of cases reasons. Cases closed because of drop out, death, client moved, transfer of clinician, etc. The important variable, in terms of success, was ‘treatment complete’ status. Below is a comparative graph of ‘treatment complete’ cases in a calendar year. Note: It must be noted that not all clinicians in the agency saw the same number of clients, some working only part-time, and others such as psychiatrists seeing only clients for consultations and were not their primary worker. 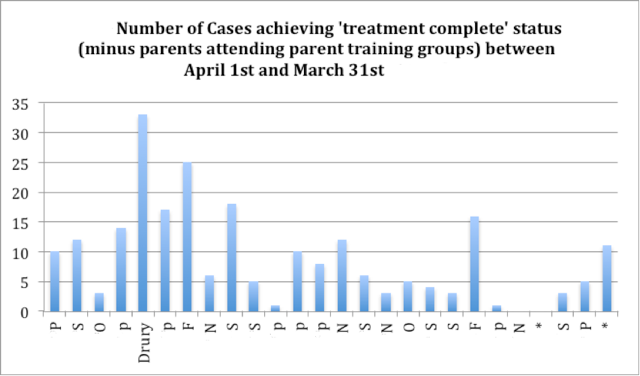 Also noteworthy, as the graph indicates, is that some clinicians saw mainly parents attending ‘parent training groups’ and were not the primary worker for their child. Even so, this comparative chart does, I believe, give some indication of my comparative effectiveness as a therapist.